We are generally not ones for awards, preferring instead to stay out of the limelight, supporting our customers as they strive to be the best in their respective industries. 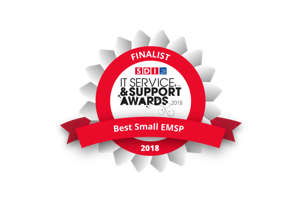 That being said, to celebrate the hard work and dedication of our team, we recently entered the prestigious Service Desk Institute annual awards where we were placed as Finalists for the best Small Managed Service Provider. Provide us with the ammunition that we need to fill this page with more awards.